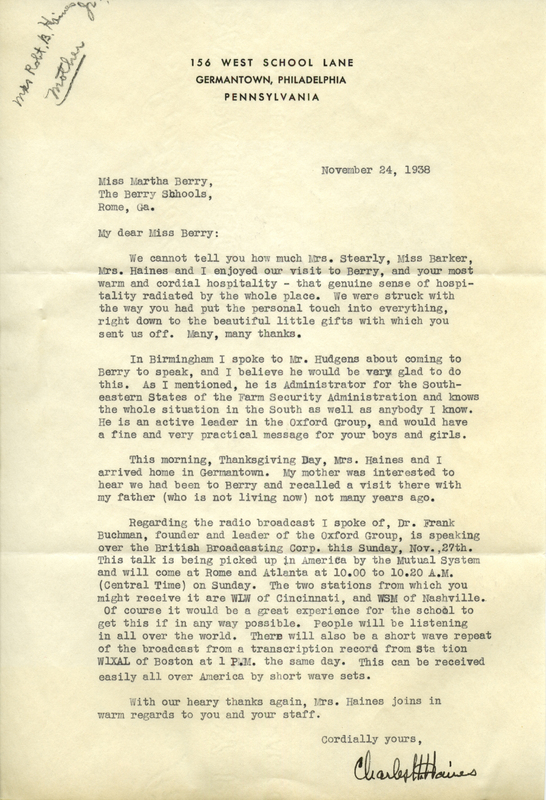 Beyond thanking Miss Berry for her hospitality and gifts, the author lets her know of a man who might be interested in giving a talk at the college, as well as the means and times when she might be able to hear a radio broadcast concerning the BBC. The author also tells of his parents' having once visited the campus years before. “MB128_8_5_001.jpg.” Martha Berry Digital Archive. Eds. Schlitz, Stephanie A., Jessica Hornbuckle, et al. Mount Berry: Berry College, 2016. accessed April 21, 2019, https://mbda.berry.edu/items/show/14266.